Americans are a 'positive' people-cheerful, optimistic, and upbeat: this is our reputation as well as our self-image. But more than a temperament, being positive, we are told, is the key to success and prosperity. In this utterly original take on the American frame of mind, Barbara Ehrenreich traces the strange career of our sunny outlook from its origins as a marginal nineteenth-century healing technique to its enshrinement as a dominant, almost mandatory, cultural attitude. Evangelical mega-churches preach the good news that you only have to want something to get it, because God wants to 'prosper' you. The medical profession prescribes positive thinking for its presumed health benefits. Academia has made room for new departments of 'positive psychology' and the 'science of happiness.' Nowhere, though, has bright-siding taken firmer root than within the business community, where, as Ehrenreich shows, the refusal even to consider negative outcomes-like mortgage defaults-contributed directly to the current economic crisis. 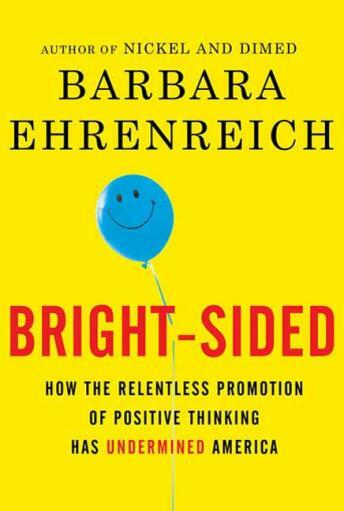 With the mythbusting powers for which she is acclaimed, Ehrenreich exposes the downside of America's penchant for positive thinking: On a personal level, it leads to self-blame and a morbid preoccupation with stamping out 'negative' thoughts. On a national level, it's brought us an era of irrational optimism resulting in disaster. This is Ehrenreich at her provocative best-poking holes in conventional wisdom and faux science, and ending with a call for existential clarity and courage.